Boundaries for UNB's Creighton Conservation Forest (CCF) - a portion of UNB's heritage lands that was set aside for conservation in 2011 - have been established in the UNB Woodlot. 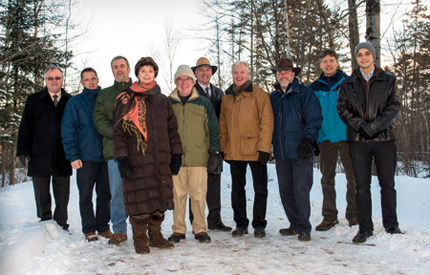 The CCF advisory committee - made up of faculty, students, UNB administration and community members - has allocated approximately 50% of the 3,800 acre woodlot to be protected from commercial development, in perpetuity, and used for teaching, undergraduate research and recreation. Forest management will continue in designated areas as a means of facilitating the teaching and research component. The area extends from Corbett Brook across to the Regent Street Bog. The location was delineated in such a way as to obtain the maximum size in one single unit of land, and to capture much of the watersheds. The variety of forested areas, some of which are harvested in different methods while others remain as reference sites, plus the other habitats such as wetlands, will allow for a wide-range of teaching and research opportunities. The forest was named after the late Dr. G. Wilfrid I. Creighton, a UNB alumnus, who was an internationally-recognized pioneer in the development of modern forest management and conservation practices. The CCF advisory committee’s next steps will be to decide on specific research activities to take place in the forest, which will be made possible through a $100,000-student-environmental-research-fund that was established by UNB's Board of Governors. It is envisaged that the CCF will continue to provide a range of benefits to the community for recreation and nature appreciation. UNB's Office of Forest Land Management (OFLM) will manage the forest along with the university’s other woodland holdings. The CCF advisory committee will provide advice to the OFLM on teaching and research programs within the forest. The heritage lands, better known as the UNB Woodlot, are part of approximately 8,000 acres of land held by UNB across the province. It has been used to support the university’s core mission of teaching, learning and research for much of its 225-year history.